The SENpro is a cost-effective spectroscopic ellipsometer without compromising advanced measurement performance. 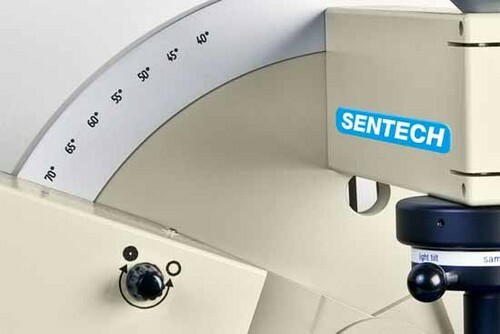 The spectroscopic ellipsometer SENpro comprises a goniometer with discret angles of incidence in 5°-steps (40° – 90°) to optimize the ellipsometric measurement. The unique Step Scan Analyzer principle is featured by SENpro. During data acquisition, polarizer and compensator are fixed to provide highest accuracy of the ellipsometric measurement. The spectroscopic ellipsometer SENpro features simple operation, measurement speed, and combined data analysis of ellipsometric measurements at different angles of incidence. It measures in the spectral range of 370 nm to 1,050 nm. The spectral range of the SENpro in combination with the sophisticated software SpectraRay/4 allows determining thickness and refractive index of single films and complex layer stacks with ease. The cost-effective, table top SENpro comprises the VIS-NIR ellipsometer optics, 5°-step goniometer, sample platform, laser alignment, fiber coupled stabilized light source, and detection unit. The SENpro comes with the spectroscopic ellipsometer software SpectraRay/4 for system control and data analysis including modeling, simulation, fitting, and presentation of data. Ready-to-use application files make the operation very easy even for beginners. SpectraRay/4 supports computer controlled mapping Mapping range from 50 x 50 mm2 up to 300 x 300 mm2 for uniformity measurements. The SENpro is focused on speed and accuracy for the measurement of thin films wherever they are applied. Applications range from extreme thin layers of 1 nm to thick layers up to 15 μm. For a large variety of applications, predefined recipes are offered by SpectraRay/4.